The 14th Annual Sarah McCullagh Dance Clinic is coming Saturday, February 2nd, 2013. Register Today! See you there! Visit our Facebook page and invite your friends! Contact us to volunteer, sponsor, or get on the mailing list for next year. The 13th Annual Sarah McCullagh Dance Clinic was held Saturday, February 11th, 2012. The theme was “Shooting Star”. Visit our secure photo site and Buy 2012 Photos! Centegra Primary Care for being our T-Shirt sponsors! The 12th Annual Sarah McCullagh Dance Clinic was held Saturday, January 29th, 2011. The theme was Supergirl. Visit our secure photo site and Buy 2011 Photos! The 11th Annual Sarah McCullagh Pom Pon Clinic was held Saturday, January 30th, 2010. We had over 50 girls, and the theme was “Pillow Fight”. Thanks for everyone’s help and donations. Order T-Shirts at the Clinic Store. Thanks to our sponsors for Clinic 2010! DVDs of the 6th, 7th, 8th and 9th Annual Sarah McCullagh Pom Pon Clinics and some older VHS tapes are still available for $10 postpaid. Call Dave at 815-337-7429 for more info. 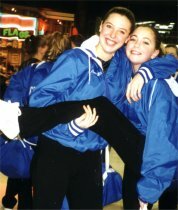 The 5th Annual Sarah McCullagh Pom Pon Clinic happened on February 14th, 2004. See info on previous clinics. The pictures are gradually being updated! NEW! Support the Sarah McCullagh Clinic! Order your books, DVDs and CDs at Amazon.com and we get 5% as a donation!